To the typical driver, it’s a sign that, if noticed, is bound to generate some curiosity, or at least some befuddlement. For those truckers and tourists headed west on Interstate 40 in western Oklahoma, bound for Amarillo, Albuquerque, and points beyond, they’ll find the sign shortly before the exit for Highway 44 and the small town of Burns Flat: “Exit 53: Oklahoma Spaceport”. A spaceport? In Oklahoma? Well, sort of. There is no launch activity today at the former Clinton-Sherman Air Force Base that serves as the site of the spaceport, and it may be two or three years at the earliest before spacecraft use the spaceport. However, much of the infrastructure needed for a spaceport, including one of the longest runways in the country as well as assorted ground facilities, is in place. Moreover, there is strong support by the state government, which has been the driving force behind efforts to convert the old air base into a spaceport. The question remains, though, just how much business any spaceport there could attract. These days, the biggest challenge can be actually getting to the spaceport itself. Despite the prominent sign on the Interstate, there are few directions leading from the exit to the facility. On a tour of the spaceport organized by the International Space Development Conference (ISDC), held Memorial Day weekend in Oklahoma City, the tour director had to stop for directions in Burns Flat, having failed to see any signs in the town directing people to the spaceport. These days, the biggest challenge can be actually getting to the spaceport itself. Once there, the old base is both overwhelming and underwhelming. It’s overwhelming in terms of scale: the airport’s sole runway, aligned north-south, is 4,115 meters long. Driving along a road paralleling the runway, the sprawling scope of the facility, and its potential as a future spaceport, become clear. With nothing but the nearby town in view, one can easily imagine a future where spaceplanes take off and land from a bustling facility on the site. It’s the present, though, that can be a little underwhelming. Backers of the spaceport note that there’s considerable infrastructure currently in place, including an office building/control tower, emergency facilities, a 2,800-square-meter hangar, and storage bunkers originally designed to house nuclear weapons. A quick tour of the facility, though, shows that many of the buildings and other facilities at Burns Flat are in various stages of disrepair. At one end of the long tarmac at the base a portion of an aircraft fuselage, apparently being disassembled for scrap, is visible, listing to one side like a wrecked ship. Given that the Air Force abandoned the base over three decades ago, the state of the facility is not surprising, but anyone planning to use it realizes that considerable work will be needed to before it can support space flights. Much of the site’s history has involved unrealized potential. The Navy established the first airport there in 1942 to train pilots during World War Two. (The outlines of the original runways at the site are still visible in overhead photos of the current airport.) After the war the naval air station was closed and temporarily turned into a civilian airport that was also used to dispose of thousands of surplus aircraft from the war. In 1954 the military returned, converting the site into an Air Force base and building the long runway to support B-52 bombers based there. 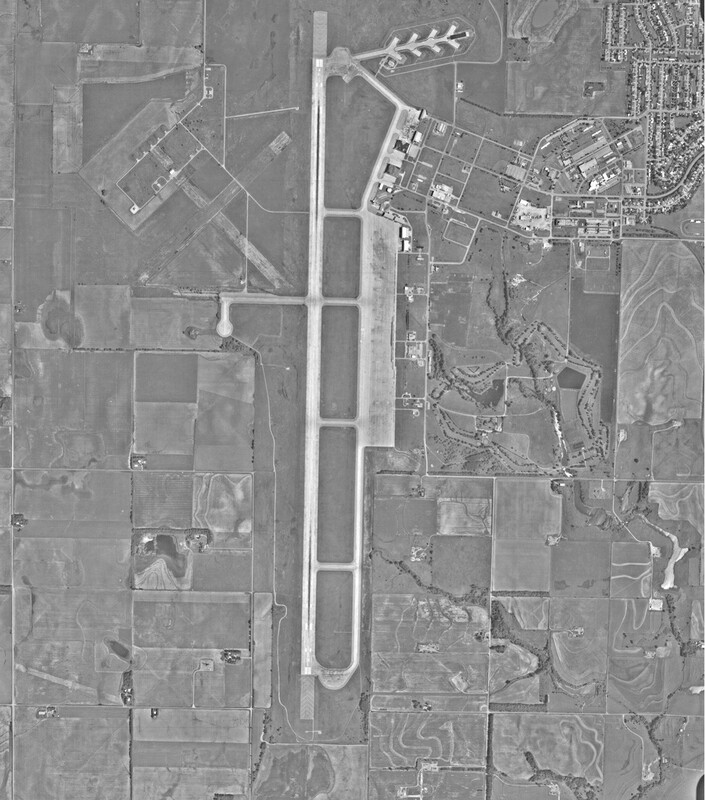 Clinton-Sherman Air Force Base was closed at the end of 1969, although the military intermittently uses the airport to this day for training purposes, such as touch-and-go landings of tankers and cargo aircraft. The base became the Clinton-Sherman Industrial Airpark, home to a limited amount of industrial and general aviation activity. Since the Air Force left nearly 35 years ago, there have been a number of efforts to convert the base into a thriving commercial aviation facility, efforts that have generally fallen through. In the late 1990s regional and state officials seized on a new use for the base: as a spaceport. At the time Lockheed Martin was planning its VentureStar RLV, which would land horizontally; other companies at the time were also planning RLVs that would take off and/or land horizontally. For them, the former air base, located in a relatively isolated area and with its long runway, was potentially very attractive. The state established a new office, the Oklahoma Space Industry Development Authority (OSIDA), with the mission of attracting companies to build and launch spacecraft in the state, most likely from Burns Flat. While the VentureStar and many other RLV efforts met an unfortunate demise, OSIDA persisted in efforts to attract companies to the state, using both the Burns Flat facility as well as a variety of incentives, including investment tax credits, sales tax refunds, and property tax exemptions. OSIDA has entered into memoranda of understanding (MOUs) with over a dozen companies who have at least shown an interest in setting up facilities in the state or using the spaceport. Those MOUs are starting to lead to concrete activity: two companies, Rocketplane Ltd. (formerly Pioneer Rocketplane) and TGV Rockets, have moved to Oklahoma in recent months, with Rocketplane in particular planning to fly its suborbital RLV out of Oklahoma Spaceport. Last month, as a sign of continued commitment to the spaceport project, OSIDA moved its offices from Oklahoma City to Burns Flat. There are, however, several obstacles in the path of converting the old air base into a spaceport. Besides the status of the infrastructure at the airport today, the facility has yet to receive a spaceport license from the FAA. Ken McGill, chairman of OSIDA, said during a presentation at ISDC that the authority is currently working on getting a spaceport license, in particular working through issues like environmental assessments, and hopes to win a license next year. That license, though, will limit Oklahoma Spaceport to horizontal launches and landings: several major commercial aviation flight paths go directly over the site, hindering its use for vertically-launched vehicles. In addition, McGill noted, there are cities and towns downrange of the spaceport, including Oklahoma City, about 150 kilometers due east. This has forced companies like TGV, Armadillo Aerospace, and Beyond-Earth Enterprises—all of which have vertically-launched vehicles and had expressed an interest in Oklahoma Spaceport—to look for launch sites elsewhere, such as White Sands in New Mexico. This has not dampened the enthusiasm of spaceport backers. One proposed plan for future development of the spaceport includes sites for a theme park, hotel, expanded golf course, and even a bass-fishing lake, in addition to facilities for the spaceport itself. Royce Jones, CEO of Spaceliner Corporation, described plans to use the spaceport for a more terrestrial form of space tourism: having people come out to see launches. During a talk at ISDC, Jones said that tourists visiting the spaceport to see launches could generate $34 million a year in expenditures, although he didn’t disclose how many visitors or launches that estimate was based upon. Jones said he was negotiating with the US Department of Agriculture (USDA) for a $100 million loan guarantee to pay for building tourist and other facilities there; he noted that the USDA has sponsored airport projects in the past as part of its mission to support rural communities. While the remote location of the Oklahoma Spaceport serves as an advantage from a technical aspect, it would seem to hinder its use as a tourist attraction. Besides Oklahoma City, the next closest major city is Amarillo, over 250 kilometers to the west in the Texas Panhandle. Jones pointed to the annual AirVenture air show in Oshkosh, Wisconsin, as evidence that people are willing to travel to rural locations for aviation events: over 750,000 people attended last year’s event. Editor’s note: please view our gallery of additional photos of Oklahoma Spaceport.